A guide for small business and fleet vehicle advertising. Vehicle advertising is one of the most effective forms of advertising right now. Whether you run a business with a dozen delivery vans or you're just trying to get your first vehicle on the road. This guide will help you turn your vehicle into a cost-effective billboard that will last for years to come. Learn why vehicle wrap advertising is so cost-effective, the benefits of car graphic designs. How to plan your budget? How to estimate cost. How to prepare your file and how to use analytics and data to ensure your design will be effective. Finally, you will learn how to measure the success of building an advertising campaign with a car wrap. We have included price calculators and ROI calculators you can use online whenever you choose. In addition, we share the top 3 mistakes to avoid when planning to do a vehicle wrap. Effective advertising will get your company noticed, make a great first impression and make a lasting impression. Car wraps do this exceptionally well. Vehicle advertising is a very memorable way to spread your business’ message. Vehicle wraps are a powerful branding and marketing tool for brands, sales, service, and delivery vehicles. One vehicle wrap can generate between 30,000 – 70,000 impressions daily. Quality impressions like these will get you a higher volume of leads and sales. It’s very probable your customers don’t need your product or service today. Most likely they will need it in near the future. By seeing your vehicle wrap, you will be in that top of mind position later because of a lasting impression for a future time. Unlike most forms of advertising, a vehicle wrap is a one-time expense that keeps working for you for years to come. Driving around the town turns your vehicle wrap into a prime advertising opportunity. Unlike digital media, you can’t swipe right and delete the impression your making on your audience. A car wrap is easily removed when and if you ever decide to resell or rebrand your vehicle. Fleet boosts name recognition 15 times greater than any other form of advertising. A vehicle wrap is targeted because your advertising to the market you serve organically as you drive around. A potential customer who is most likely to see your vehicle wrap are the individuals that live or work in your area. A well-designed car wrap will deliver your marketing message to your target audience, as you build trust and credibility in your local community. Trust and assurance are essential if you want to influence your market build rapport and grow your business. Are you renting traffic from Google Adwords or Facebook? 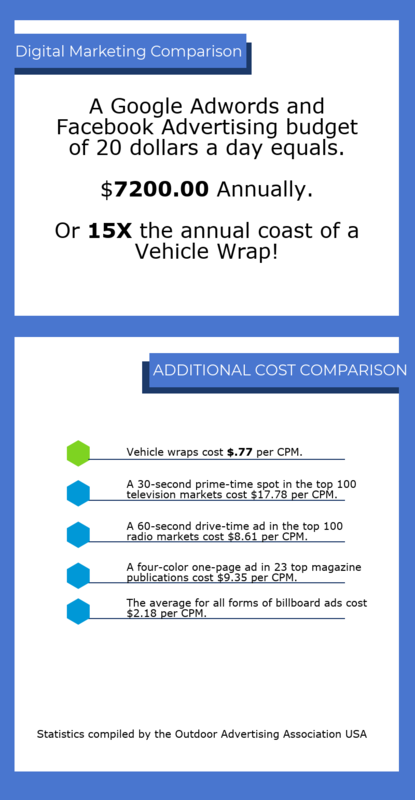 Cost benefits of a vehicle wrap are amazing when you compare its cost to the Cost Per Thousand Impressions (CPM) of other forms of advertising. And remember online ads only work as long as you keep paying for them. Vehicle wraps work 24/7 for years to come. 96% of Americans traveled in a vehicle as either a driver or passenger in the past week. One vehicle wrap can generate between 30,000 – 80,000 impressions daily. Online channels like Google and Facebook are can be effective forms of advertising if you own an e-commerce business because you can measure ROI and ROAS so easily. With almost every other business especially B2B or B2C local services. It can be more difficult to measure your conversions. Our Vehicle wraps start at $14.00 per square foot completely installed. 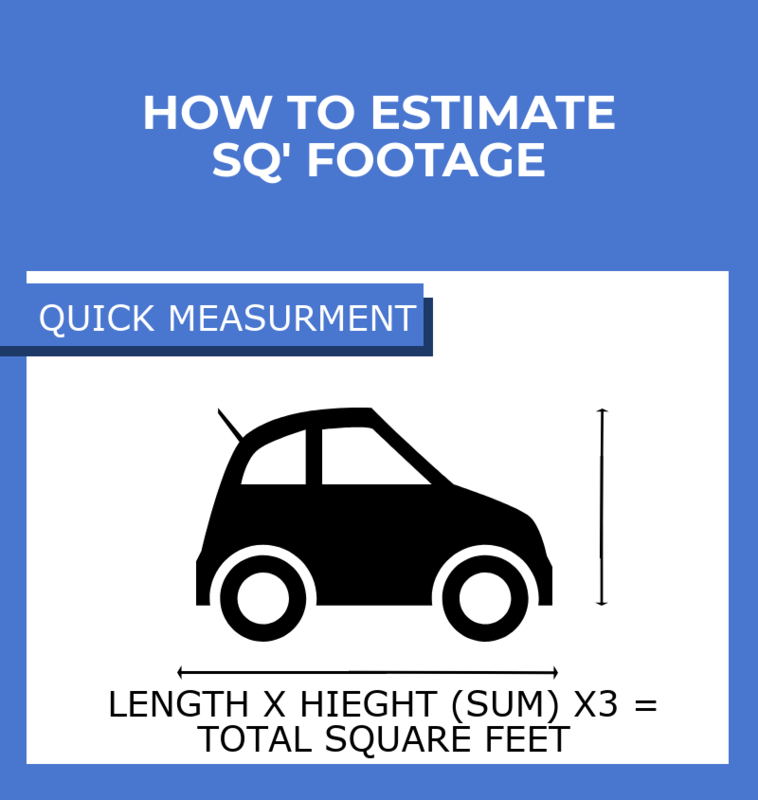 Here are the details of what involved in getting to that square footage price. A car wrap price depends on a few variables. Square Footage, Complexity and Media (quality). 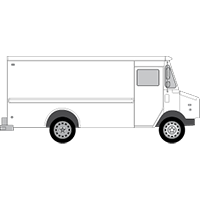 Generally speaking, pricing on an average graphic advertisement wrap for a van is about $2500. This is the kind you would use to advertise your business. Square footage of the vehicle. 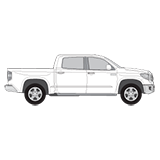 We have chosen several popular sizes of cars, trucks, SUV’s, fleet vehicles box trucks and food trucks for a basic reference point. 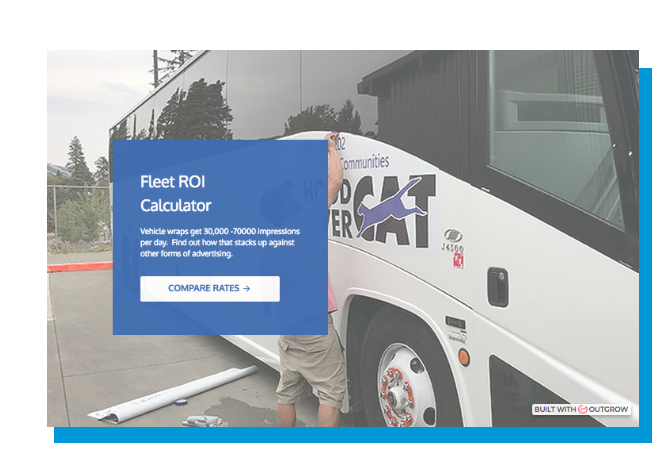 Please reference our vehicle cost calculator (scroll down) to find your vehicle size, and then use the calculator to get a ballpark price. small size car may cost more than a larger fleet cargo van. The reason is the cargo van may not be wrapped on the bumpers or rooftop. It may not make sense to wrap an area which is not visible. 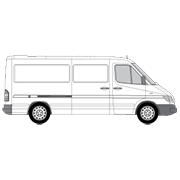 A cargo van has fewer windows than the compact sedan which means fewer cuts and the type of wrap would also make a difference. Mercedes Sprinter Van, Ram Pro-Master, Ford Transit, Nissan Cargo. Grumman Bread Truck, Mercedes-Benz Vario Box. Hino 300 Box Truck. 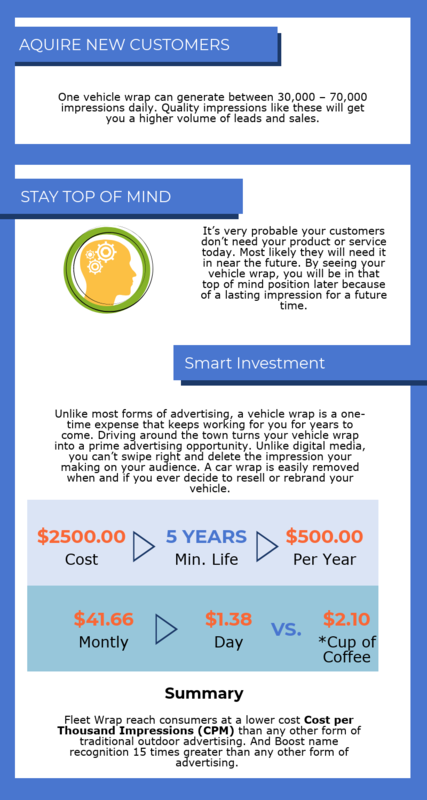 There is not a standard return on investment (ROI) for vehicle advertising because it will depend upon the kind of business you have, when and where the car is driven, and the messaging and design of the wrap. 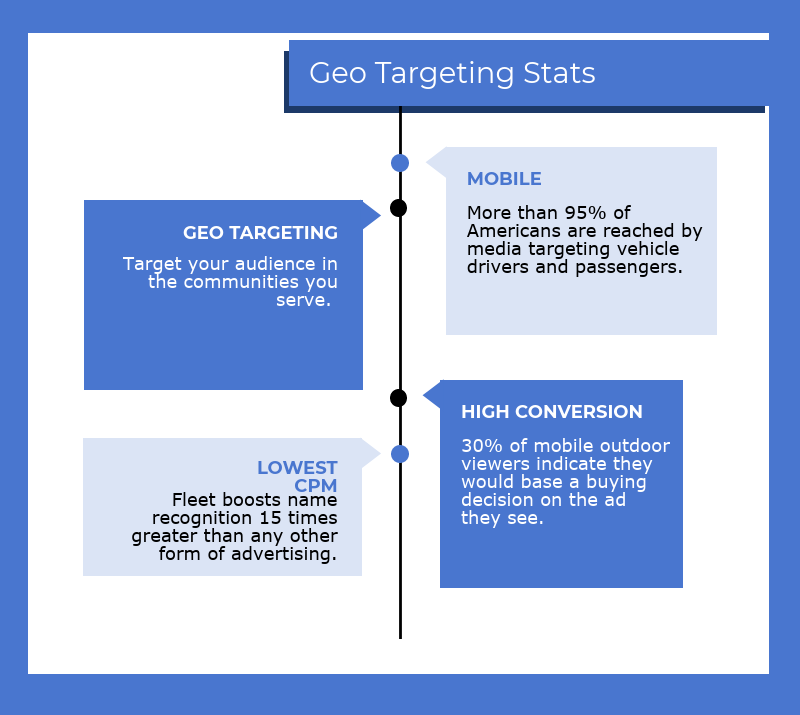 However, there are ways to optimize the advertising campaign with a few smart tactics. 1. Keep the vehicle on the road. Every mile driven can yields on average, reach up to 600 to 1,000 impressions. 2. Offer a separate contact number. Keep track of leads that only comes in on that phone line. 3. Promote a special discount rate or a deal that is only offered on the vehicle. 4. Build a special landing page for your website and put the URL on the wrap. 5. Park vehicle at the customer's or key locations when not being driven. 6. Hire drivers during downtime: Not all businesses require continuous travel. A vehicle wrap can still be a good marketing tool. 7. Allow employees to take the vehicle home a couple of times a week. 8. Incorporate keywords, social media into your design. 9. 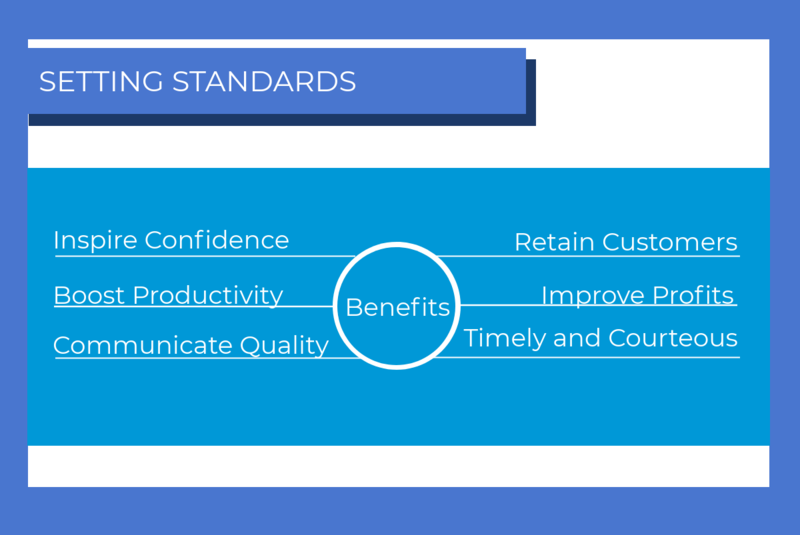 Be sure to have consistent designs across all your marketing channels. A cohesive look is important. A potential customer will be able to validate they have found your business website. Like with any marketing effort, set your budget and plan for your expenses. It’s important to know what you can afford. Make sure in include the wrap printing and installation and graphic design in your budget. Our online calculator or requesting a quote from us will be resourceful tools. Both are free. Consider who in your organization needs to “buy in” A will prepared a quote with mock-up graphics in addition to cost benefits from this guide are a great way to align everyone in your organization. How much you choose to wrap needs significant consideration. It will affect your budget. You need to ensure your branding, and advertising objectives meet your goals. A full wrap doesn’t necessarily mean your message will be more effective. It’s all about how you use the given space to illustrate your message in a way your target market will best receive it. Working with a professional graphic designer can help you navigate these decisions successfully. Based on your budget, messaging and brand narrative, you can wrap your vehicle in four popular ways styles. Why this step is essential. Car wraps are an extremely cost-effective advertising form over the life of the advertising campaign (how long you keep it on the road.) As you know by now, the only drawback to this style of advertising is the expense is upfront. That means you get one chance to ensure your branding and messaging is spot on. You may be faced with onboarding other people in your organization. If it's your job to facilitate a final decision about the design, it can be a challenge to align interest. Everyone will have an opinion and assumptions. We have found opinions and assumptions not very resourceful at sign off. It causes unproductivity, analysis paralysis, and division that may show up later in your organization. That can be a risky proposition for one person to champion into a final plan. Here are a few different ways the decision maker of a graphic may be judged on. It's important to think about the risks associated with your options. What's the safest decision? What's the riskiest one? Are there any steps you could take to minimize the risk of that option? There is three significant step you can take to ensure your decision is spot on. 1. Work with a professional graphic designer. 2. Work with a Professional large format printer with professional wrap installers to manufacture your project. 3. Check your graphics designers work with technology, not opinions. Use Visual Attention Software. It's like having a spellchecker and editor look at your writing before you publish it. If you spent $2500.00 on writing. You would do the same thing. This step is typically overlooked because most people are not aware this technology is available or they are not willing to pay for the service. We use it and offer it as a part of our service. It's that powerful. 3-5 seconds. That’s about all the time you get for your design to be noticed or lost in the shuffle. What if you could predict what people are likely to see in those critical seconds? And use that knowledge to make your designs stand out? Predict behavior with data-driven insights and analytics powered by visual design software. VAS analyses your designs, using algorithms developed by 3M scientists. VAS simulates what people see during the first 3-5 seconds of viewing. VAS can analyze almost any visual—print ads, web banners, store shelf planograms, billboards and more. We can help you win the visual clutter battle. Using smart insights and analytics can help you get noticed before you hit print. Getting noticed is the first step in effective advertising and branding. Get pre-production feedback that ensures your design is spot on. Say goodbye, unproductive meetings. Get more done. Using VAS will help y0u gain consensus and support recommendations. Increase confidence. Reduce subjective feedback and churn by adding objective data to the discussion. Step 1: Send us a photo of the vehicle graphic mocked up on the vehicle. Step 2: We will analyze your design and then send you an email with 5 key areas of interest that you can use to optimize your design on your second go around. We will deliver five solid reports in one easy to read PDF that is emailed to you. These reports are generated by 3M they can help with all aspects of improving Visual Design. 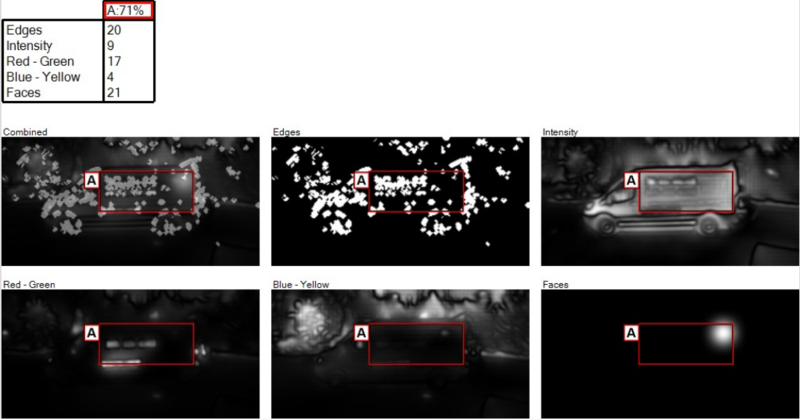 The Heatmap report highlight areas of the image that are likely to receive attention within the first 3-5 seconds. The Sequence Report indicates the first 4 most likely eye fixation points, in order. The Areas of Interest Report provides results for the specific areas and objects you marked up during the prepare step, prior to analyzing the image. The Visual Elements Report. VAS analysis identifies 5 visual elements science has proven to attract human visual attention when we first glance at an image or scene, but before we’re aware of what we’re looking at. They are Edges, Intensity Red-Green Color Contrast, Blue-Yellow Color Contrast, and Faces. Use these reports to identify opportunities to improve the visual design and messaging of your vehicle. It normally only takes one tweak with your graphic artist to feel like you have eliminated any basic mistakes. Confidence gained! We are happy to rinse and repeat until you and team are completely satisfied. Ready to see your design in action? Drop us a line today and we will send you a full report of your graphic. It's fast and free. Once you've decided to take advantage of your vehicle space for advertising, the next step is connecting your project with a large format printing and graphics company that specializes in vehicle wraps. We have found communication is the most important factor making the entire process run smoothly, on budget and with your desired results. Here is a checklist of essential things to consider when you ask for your first quote. Budget - What is your company willing to spend on this advertising campaign? Campaign lifespan - The lifetime of the wrap/campaign - How often do you hope to change graphics? 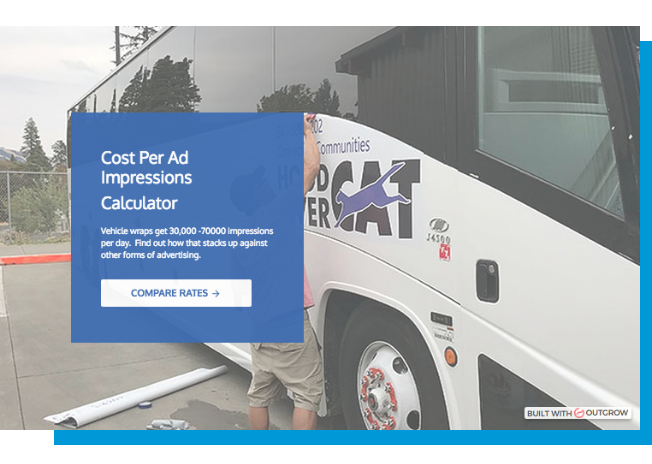 (ROI) - Have you calculated the long-term return on investment of vehicle advertising? 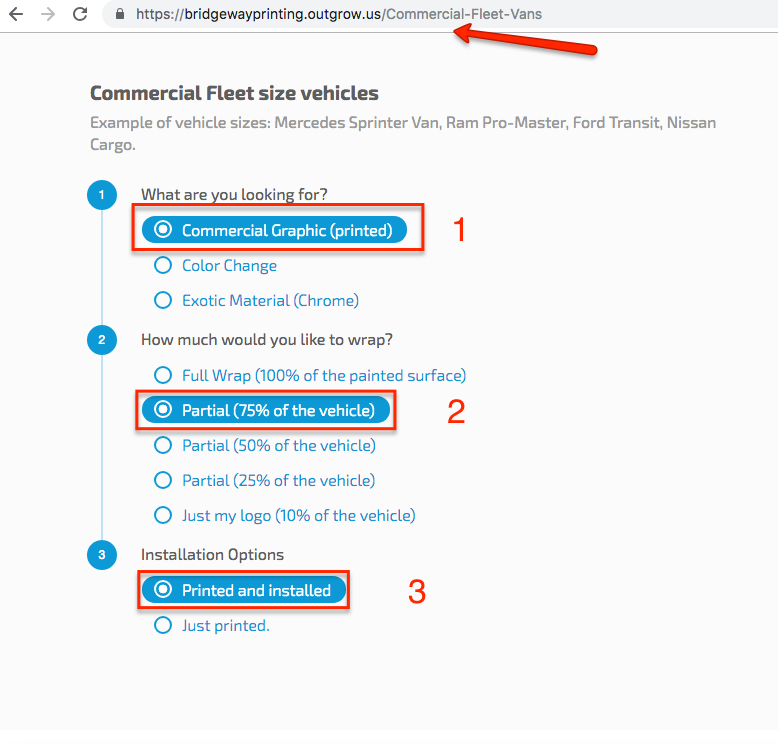 Fleet size - How many vehicles are receiving graphics? Fleet location - Is it a local job, or a nationwide effort? Timeframe - How quickly does the job need to be finished? If any of this is confusing feel free to ask questions. A good Account Service Representative can walk you through different scenarios, make recommendations and answer questions. Now that you're confident in your needs and options you are ready to get the campaign produced and installed. At this stage, a detailed professional quote will valuable for all parties concerned. Here is are some considerations when reviewing your quote. Cost - Everyone tends to skip right to this number, and then backtrack to the details of what the quote is. The final number is important. Remember to put that number into context. Consider cost in relation to the ROI. Materials - Every wrap incorporates the same ingredients: Vinyl, Ink, and a top coat to protect the ink from scratches, weather, and most important the sun. Ultraviolet damage is the number one threat to the life of wrap. Quality top coats offer UV inhibitors that significantly increase the life of your wrap. 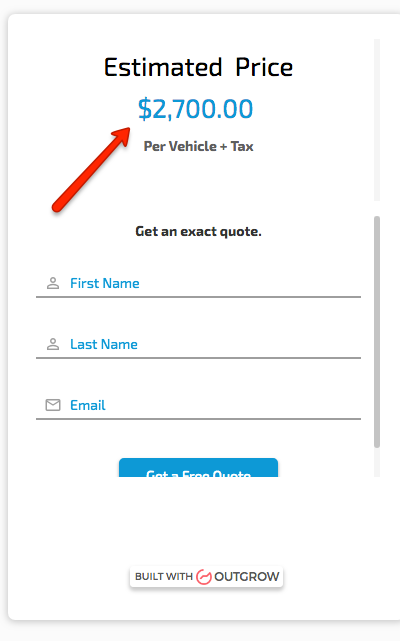 Make sure your quote list what types of materials are planned to be installed on your vehicle. We are partnered with well-known manufacturers like 3M, Avery, and General Formulations for vinyl. Each brand offers a product that offers a variety of price and quality that can be mixed and matched build the best possible solution for your vehicle. The other consideration is the ink and the top coat. Higher quality materials and installation will cost more up front but may save you money on the back end. Installation details - Is a distribution network available? Where are the installers located? Large-scale wrap jobs can be done on-site, this can save you money in the form of human resources, fuel, and downtime. For complex jobs, it can make more sense to do the job inside. Is weather going to affect the timeline? Look for these details on your quote and feel free to ask questions. Good design takes time. Don't rush it. Our designers can create a branded story with a solid Call To Action (CTA) from scratch, or we can convert your artwork to fit any vehicle. Remember to allow time for analytics revisions, buy in time, etc. Adobe Illustrator vehicle outline template. All images must be embedded, all fonts must be outlined. Adobe Photoshop Image-based vehicle template. Artwork must be created and submitted at 720 PPI/ 10th scale. Images must be editable and created/submitted at 720 PPI/ 10th scale. To ensure that your vehicle graphics work as you expect them to, we provide accurate proofs before starting full-scale production. We can do this in advance if you need to use them for stakeholder meetings. We offer high capacity, high quality, and fully dedicated project management with personal service. We manage and loop you into every detail along the way, ensuring a smooth delivery. 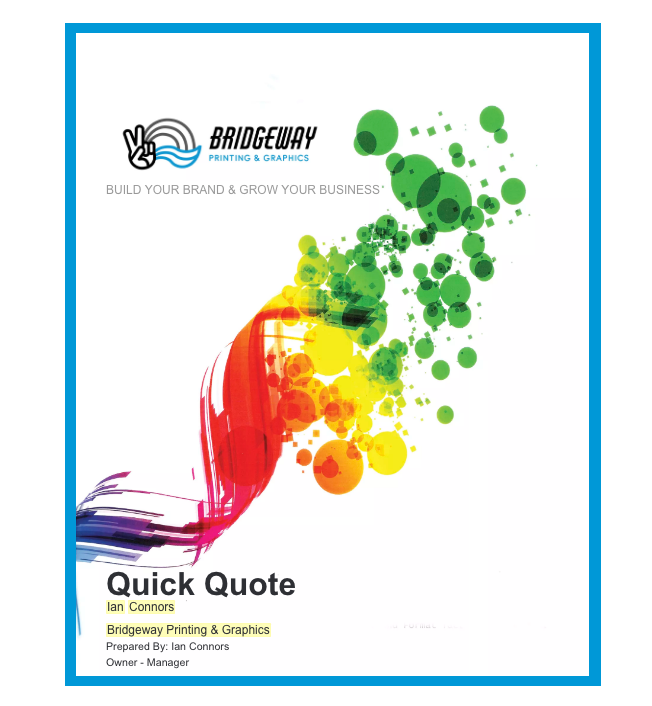 Every project is managed and printed in-house. Our in-house team handles most wraps. If your project transcends our local geography, you can trust our national network of certified installers to apply your graphics wherever your fleet. It's a proud moment. If this is your first vehicle, gather your employees for delivery. Use it as a team-building moment. Let that moment inspire you to continue to grow your business to have an entire fleet one day. In the meant time we are ready to keep that fleet on the move by providing an efficient and frictionless process. Get the most out of your or your investment, follow these do and don't tip's for cleaning your vinyl vehicle wrap. This practical information is simple to follow and can make your wrap last for years. 1. Start with a blend of mild detergent and clean water and hand wash. Never pressure wash. It can cause vinyl wrap to lift around the edges and degrade the vinyl film. If this happens, the graphics lose luster, fade, crack and can lift away from the substrate. 2. Always read the warning labels on car care products for proper safety instructions. 4. Wash the vehicle from the top down with a soapy water blend, rinse with clean water. Let gravity remove dirt and contaminants naturally run off the vinyl. A garden hose and nozzle and a clean grit free bucket, and microfiber washcloth or sponge. Mix the water with a mild soap like Dove or Joy. The objective is to avoid scratching the vinyl. 5. Let the vehicle air dry or dry off with a microfiber cloth. If time allows, let the vehicle air dry and touch up with a soft fabric for spotting. If the vehicle wrap is to be dried by hand, use clean, microfiber towels and light pressure. Take care not to lift edges or scratch vinyl. Do not allow fuels or other corrosive substances to stay in contact with the vinyl. Clean all spills as soon as possible. If soap and water cleaning procedures do not work to remove heavy debris, try spot cleaning with isopropyl alcohol or a citrus based cleaner with a microfiber towel. Do not apply carnauba-based wax or any wax, polish, matte or carbon fiber over vinyl graphics. Doing so will result in deterioration of the vinyl film. Do not use a hand-held or mechanical brush or pressure washing on your vinyl. Brushes can cause vinyl graphics to scratch chip or peel around the edges or scratch the surface. It can fade and dull the appearance of the overlaminate and graphic. 3 to 5 second is all the time you have to get noticed. Make sure your design cuts through the clutter and is not the clutter. Trying to say or do too much may make the car wrap appear cluttered. Instead of informing people about your brand or services the opposite happens. Potential customers are unable to read the messages. Some colors do not go well together. When designing the vinyl vehicle wrap be sure to use colors that will look good together. It’s not a good idea to create a graphic that will hurt peoples’ eyes. Advanced visual design software that was only available to large companies with super budgets is now reasonably priced for small businesses just five years ago is now pretty affordable. Taking time to have your design analyzed can let you make data-driven decisions about how your graphic will design before you print. We use Visual Attention Software. VAS developed by 3M. Spending 2500.00 on a car wrap plus the design and not validating its efficacy with Visual design software is like not running spell checker when you write a document. A professional installer should include visual design services for free. These design errors can be fixed by keeping the design simple, concise and attractive. Use colors that work together not clash. Using professional graphic artist experienced in vehicle advertising will ensure you don't see these mistakes on your vehicle. Take time to run your designs through a visual design process. These analytics and insights will help with all aspects of improving Visual Design. Drop us a line and receive personal service.